On Friday evening, August 18, 2017, Kissimmee Police Department officer, Matthew Baxter (27 years old), was shot and killed in the line of duty. He was an exceptional man. His love for his community and country spread into all areas of his life. Matthew was a loving husband, father, brother, and son. He was an active member of his community, dedicating his free time to volunteering with organizations such as Big Brothers and Big Sisters, Operation Chill, and YMCA’s Get Your Game On. 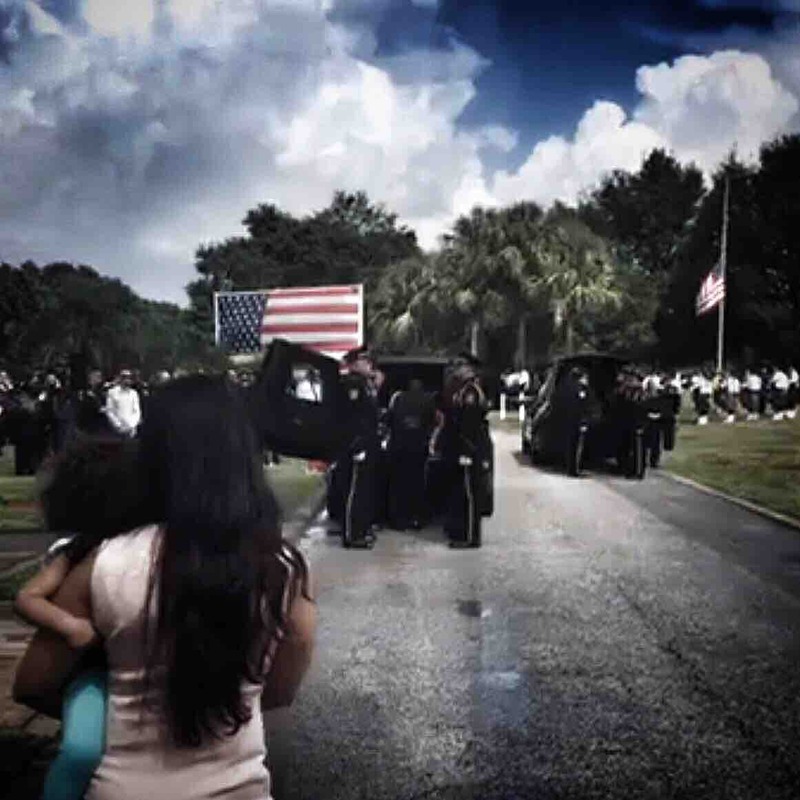 He is survived by his wife Sadia, who is a detective, also with Kissimmee Police Department, and four daughters, ranging in age from 7 years to 7 months. Proceeds will go directly to his young widow. My name is Jemlynn Tatlonghari and I have been a friend of Sadia's family for over 16 years. I am managing the campaign on behalf of the family, but the funds will be handled directly by them. Joint funeral for Sgt. Howard and Ofc. Baxter will be Thursday, August 24, 2017 at 11:00 a.m. at First Baptist Church of Orlando located at 3000 S. John Young Parkway, Orlando, FL 32805. Interment will follow directly after the service and will be located at Woodlawn Memorial Park & Funeral Home 400 Woodlawn Cemetary Road, Gotha, FL 34734. PLEASE READ AND HELP US SPREAD THE WORD! Warning: This is a long one, but a goodie! This is especially important since Suntrust will begin accepting donations today! Over the past 28 hours, we have received 239 donations to the gofundme account benefitting the widow of Officer Matthew Baxter. This platform has provided us with the ability to reach people across the country and world this weekend. Unfortunately, some confusion has resulted as well. Kissimmee Police Department initially reported that all gofundme accounts associated with this event were scams and this news spread just as quickly as our outreach. It is unfortunate that we have to be cautious in our efforts to help each other, but the tradeoff for the convenience and immediacy of sites such as gofundme is the possibility of fraud. The purpose of this post is to ask that you help me spread the word that this is a REAL account with Officer Baxter's widow, Sadia, as the sole beneciary. She, and she alone, has the access to your donations. I am only here as an intermediary so that she can grieve, care for their children, and tend to the matters that need to be addressed. 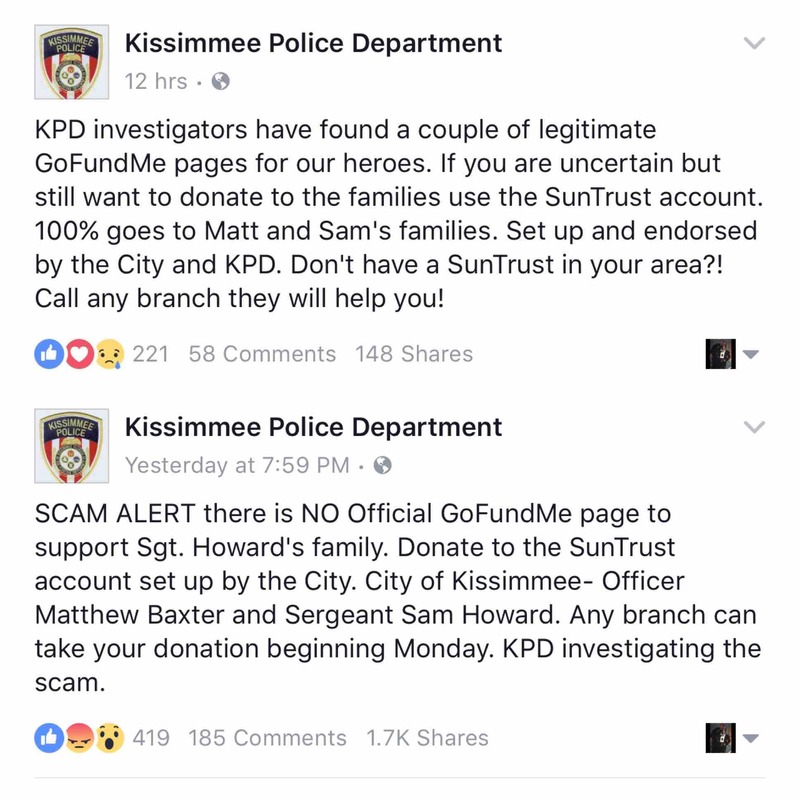 Kissimmee Police Department has since acknowledged the authenticity of campaigns such as ours, outside of the fund they have established with Suntrust. Some people have pointed out that it is better to donate at Suntrust because 100% of the donations will go to the beneficiaries. Yes, gofundme charges a percentage, which they disclose on their site, for the platform and processing. Ideally, every cent would go directly to the recipients. However, not everyone can realistically make it to a branch during the week. Any Suntrust banks that were open yesterday closed at noon. Our first campaign post went up at 4:44 pm yesterday afternoon. In that time, we have raised over $11,000 thanks entirely to you all. We are not discouraging anyone from donating to the fund established by the city with Suntrust. It is beautiful that the underlying sentiment beneath this confusion is that you all wholeheartedly want to ensure that the money goes exactly where it was intended. We endorse KPD’s statement that if you have any doubts about the legitimacy of online campaigns, it would be best to donate through Suntrust. We hope that the uncertainty around the legitimacy of this campaign has not resulted in anyone deciding not to donate at all. The families appreciate your support, financial and otherwise, no matter how you send it. Thank you all for a wonderful weekend. I’ll provide a final update on our progress before I go to bed. You all have exceeded my expectations and I can’t thank you enough. Please keep us in mind and heart as our weeks get muddied by those everyday things that tend to distract us. I won’t be able to post as much or be as responsive during the week because I do work, but I will check in on you all and provide updates in the evenings. I’ve had a blast with you all this weekend… despite the circumstances. Thanks for all the love! Keep an eye out during the week and help us keep the fire going! All my posts for the campaign are public and waiting for you to keep sharing! The video in my previous update was a hit! Spread the love!